Artist Bhakti Baxter led children in making sculptures of kids. What a pleasure to see the sampling of art that just opened on the second floor of the downtown LegalArt building (a Knight Arts Challenge grantee) in Miami. There is an impressive, pastel-colored, spray-painted canvas covering one wall; on another, a large, multicolored, epoxy-covered sculpture. In the middle of the room, a bunch of wonderful little sculptures, made from all sorts of materials that look like, well, yes, a bunch of little kids. All of the above were made by children as part of a summer camp program sponsored by Artoconecto, which paired the kids with local artists to come up with these collaborative works — in the case of the pieces above, with Douglas Hoekzema, Sinisa Kukec and Bhakti Baxter, respectively. It’s a pretty cool collaboration all around, as the program and this resulting exhibit, called “KIDSART Bridges: Tolerance and Understanding,” also involved children from across the Atlantic in Croatia. So in another corner, hung above a bit of floor covered in hay (which perfumed the room with a great rural essence), are some really lovely paintings crafted from the kids of this formerly war-torn Yugoslav republic. 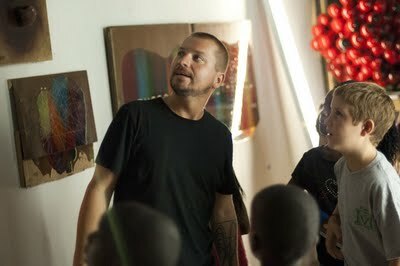 (In an interesting cross-pollination, one camp artistic “counselor” in Miami, Kukec, is a Croatian native). A current LegalArt resident, Pachi Giustinian guided her group of children in a workshop through some experimentation with abstract painting, which, in the end were pieced together in a semicircle on another part of the floor — almost like they were coated place-mats, fit together on a huge table. Giustinian and Baxter also had works of their own placed near the collaborative pieces; maybe as a “guide” as to the origins of the inspiration. The burgeoning artists and their camp leaders arrive at LegalArt. The fifth artist who participated in the workshop camp, Leda Almar, decided to get the children to explore the often difficult task of figurative drawing. The result is the revealing series of children’s portraits. Upstairs on this opening night, the studios of the first year of residents at LegalArt were also opened up, giving the public a glimpse of what has been created during this inaugural incubator program. The live/work spaces are handsome and the work appropriately varied, from the in-house residents Viking Funeral (Carlos Ascurra and Juan Gonzalez), Jiae Hwang, Manny Prieres, Giustinian and the ™ Sisters. They will be departing by the end of the year, when a new group, now being considered, will take over in February 2012. 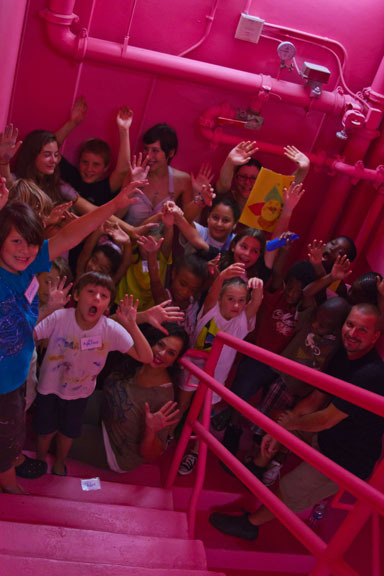 “KIDSART Bridges: Tolerance and Understanding” at LegalArt, 1035 N. Miami Ave., Ste. 220, Miami; www.legalart.org.